AC regulating - protects against both brownouts & over voltage conditions. Protects against any power problem other than a blackout. Will operate through a 3 millisecond (minimum) blackout. Long life - ferroresonant design - no moving parts. Ferroresonant design also filters out surges, line harmonics, and RF noise. 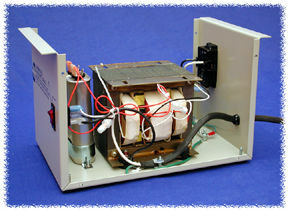 Output 120VAC (+/- 3 %). Noise Isolation (RF) of 120 db common mode, 60 db normal mode. 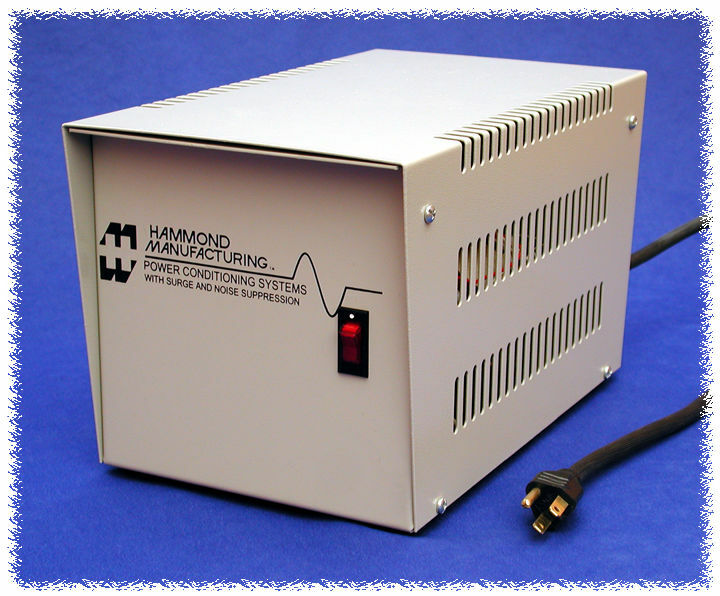 Units also include a 2nd stage of high frequency filtering on the output - a Hammond Mfg. exclusive. Operating temperature range of -40 degrees C to +40 degrees C.
Front panel lighted power switch. 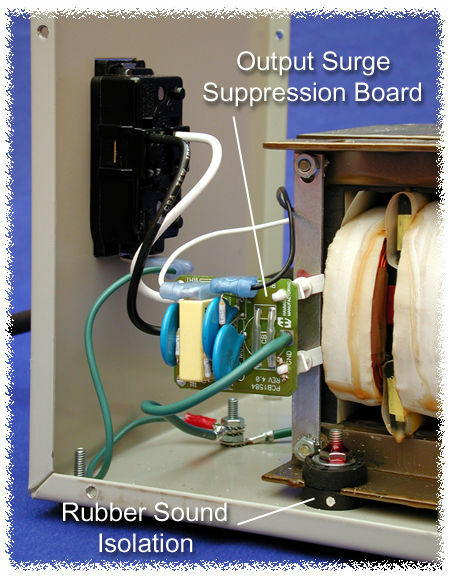 Input (primary) connected to an extra long 15 foot, heavy duty 14/3 SJTW cord for extreme temperature ranges. Integral molded, standard North American plug (NEMA 5-15P). 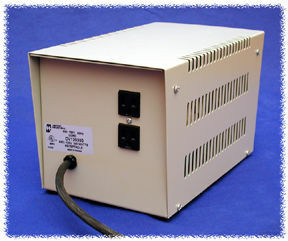 Output (secondary) connected to a rear mounted, standard North American, grounded receptacle (NEMA 5-15R) - quantity depends on power capacity of unit (see table below). 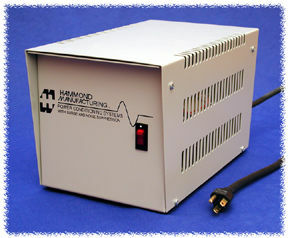 Rugged two piece ventilated steel enclosure. Finished in a grey/beige color, textured powder paint with rubber feet installed. NOTE 1: Due to the nature of ferroresonant designs - these units do produce audible noise. We have reduced this through careful design, but these units are NOT usable in an office environment. NOTE 2: These units provide complete isolation from the source voltage. In other words, the "neutral" output wire has no connection to ground, this is a UL requirement for this type of device. Therefore plug-in circuit testers & line "polarity" testing devices will NOT function on the output as it is completely isolated. North American Mark of Safety: C UL & UL listed (File #E211544).